BUENOS AIRES, Argentina—A magnitude-6.4 earthquake has struck north-central Argentina, shaking things up enough to make people evacuate some buildings in the capital hundreds of miles (kilometers) away. The U.S. Geological Service says the quake’s epicenter was 80 miles (130 kilometers) southeast of Santiago del Estero, a provincial capital of 250,000 people and the 12th-largest city in Argentina. It was centered deep underground, nearly 400 miles (600 kilometers) below the surface, where quakes generally cause less damage. The shaking prompted people to spill out of the San Isidro courts building in Buenos Aires province Friday morning. An earthquake with a preliminary magnitude of 7.1 struck Friday off the coast of Alaska, the U.S. Geological Survey reported. The quake was initially reported to have occurred a depth of 6.2 miles, but the Geological Survey later updated its reading to say it was 22 miles deep. The earthquake occurred 120 miles east-southeast of Atka, Alaska, in a sparsely populated part of the Aleutian Islands known as the Fox Islands. The epicenter was 1,658 miles west southwest of Anchorage, the Geological Survey said. Every hurricane season, climate scientists are asked how climate change is impacting hurricanes. The short answer is that global warming makes the ocean warmer and increases sea surface temperatures, which can make hurricanes stronger. But several factors, including differences in wind speed and direction, can break up hurricanes. Many future projections show a decrease in the frequency of all hurricanes globally, but a higher chance of intense hurricanes forming when they do occur. 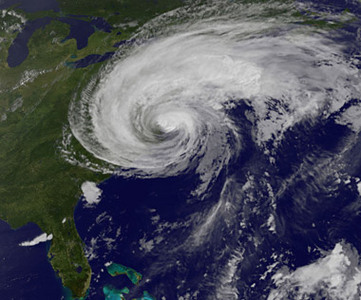 The changing nature of hurricanes in a warmer world remains an active area of research. In 2010, the Manhattan-sized Petermann glacier iceberg enters the Nares Strait: Credit: European Space Agency. An ice shelf is poised to break off from a Greenland glacier and float out to sea as an island twice the size of Manhattan, scientists say. Just a year ago, in August 2010, the same glacier produced an even larger iceberg — a mass of ice four times the size of Manhattan, the largest in recorded Greenland history — yet researchers warn that the next spectacular break could have more-dire consequences. 3 New Zealand Super Volcanoes Are Rumbling!